For the past seven years of living at Yonge and Finch, I never stopped at York Farmers Market. I often would pass by it and I was always in a hurry to go somewhere that I clearly have taken it for granted. It is funny how I often wished there was something like York Farmers Market close to me and I didn’t came to explore it. This weekend, I decided to right that wrong. I finally walked in York Farmers Market and boy, they gave me a big surprise! From the outside, my initial impression was that it was one establishment, sort of like a grocery. What I found inside was a mini St. Lawrence Market. Housing a variety of vendors I was aghast that all this time it was right under my nose. I was so repentant as I slowly moved from one booth to the other. There were food booths that included bakeries, a butcher, honey, coffee, soup, jellies and of course fresh produce. There were jewelries, fabrics and a booth of antiques. I was so happy that I could take my time to walk slowly and check everything out. Twice I stopped and I got into conversation with the vendors and I just love the friendliness and the conversation. I picked up a few things. I just have to pick up Sweetness & Flight vanilla fudge. I impulsively had to after I tasted it. 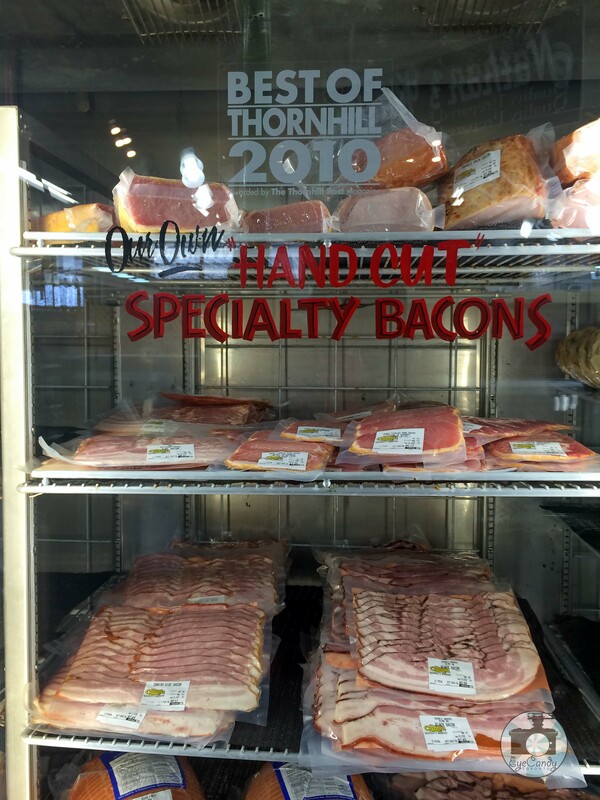 Moving towards the butcher, I cannot help but stare at a fridge that had so many kinds of bacon. My heart was doing pitter patter in excitement as I tried to decide which one to bring home. I finally settled for maple bacon. I considered getting some cheese but I just recently shopped for some. I guess I just have to come back for that. Seeing a booth with a warm serving buffet, I was curious about what they were serving and it turns out to be pasta. I was not ready for that as I just had a hearty brunch. But when I came to the soup booth by the Jelly Boys, I picked up a small mason jar of their Roots and Super Greens. It was quite hearty and full-bodied despite being vegan. There was a freshness to it that I really liked. This soup quickly disappeared when I got home. That soup alone can make me go back for some more. York Farmers Market is a real gem of a discovery for me. I would definitely be a regular after what I saw. I am excited to see it during fall or Christmas! I know that we are all wishing for warmer weather but that picture of the warm reds of fall and the splendour of Christmas just played in my mind. Places like York Farmers Market has that touch of nostalgia that moves me. I definitely want to be a part of this local farmers market. So check them out and then you would understand why I am so smitten. Thursday, Friday: 10:00 a.m. to 7:00 p.m. I didn’t know about this place, thanks for the post. I like the fact that they’re open on Sundays.